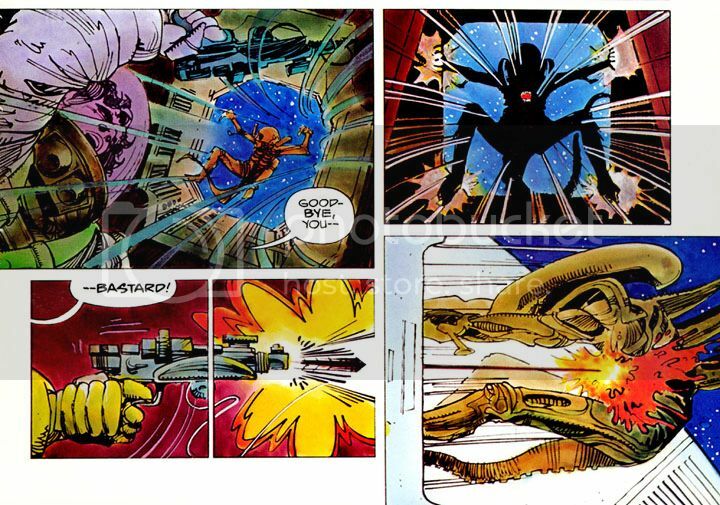 Years before Dark Horse introduced the infamous xenomorphs into comics, Heavy Metal had Archie Goodwin and Walter Simonson team up for Alien: The Illustrated Story, an adaptation of the first Alien movie. Kind of a strange item. While its publishers aimed Heavy Metal magazine at adults, I'm not sure how much of an audience existed at the time for what amounted to a full-color graphic novel based on an R-rated film. People read Heavy Metal, people went to see Alien. Were these the same people? Or, if not, could they be brought together in the bookstore for a book self-consciously eschewing the comic book label in favor of this "illustrated story" invention? Someone thought so, hence this book. Somehow its existence escaped me the first go-around-- and I've been a huge fan of Ridley Scott's sci-fi horror flick since I was approximately ten years old. I was a fan of it even before I was old enough actually to see it, mainly because one of my brothers saw it and liked it enough to buy a book about its production, which he passed on to me. And which thoroughly grossed me out and fascinated me at the same time. Even stranger, there were Alien action figures in the toy store at the mall. The point is, much like the unfortunate John Hurt character in the movie, I was exposed to the spore and it grew inside me. It wasn't until a couple of years later, on an appropriately stormy night while I was home alone that I was finally able to watch the film on HBO. It didn't scare me (and I'm easy to scare), but I enjoyed the horror elements and the funky, shabby-looking spaceship. 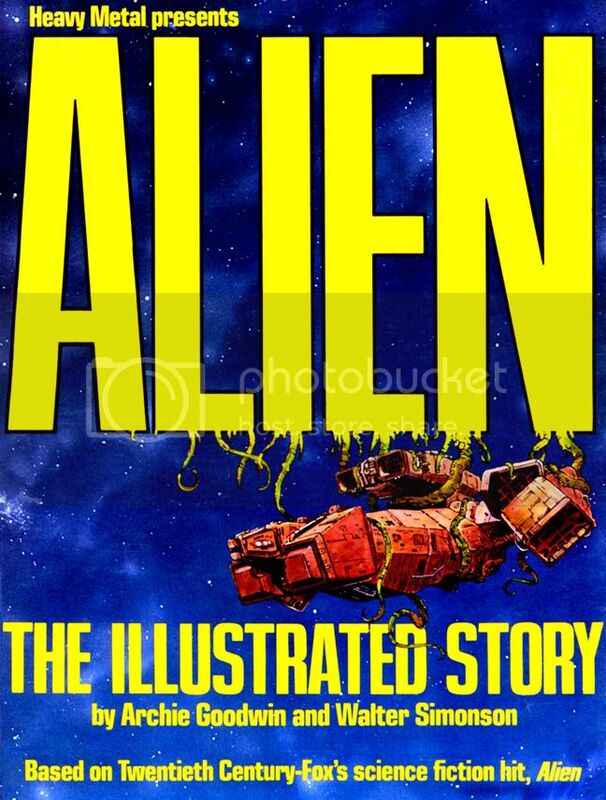 Years passed and I found out about Alien: The Illustrated Story, probably from one of the TwoMorrows magazines. Since I'm also a fan of both Goodwin and Simonson (but not Heavy Metal magazine itself or the Dark Horse series for some reason) I went to Ebay and there it was. Even though it was out of print at the time, I bought a nice, clean copy for a fairly cheap price. It's probably not mint, but then I bought it to read not to file away in some climate-controlled vault. But what a book! It exceeded my expectations in every way. Goodwin confines himself largely to dialogue, with just a few tersely-worded captions here and there, most prominently on the first and last pages bookending the story. He provides just enough information to get us started, then smartly leaves Simonson to carry the narrative load. Simonson does an absolutely smashing job. It's obvious from the way he stages certain sequences and from the accurate costuming he had access to a lot of studio-provided material, but Simonson doesn't let himself get too involved with photo reference. If he had, it would have resulted in some dull storytelling. His likenesses are more along the lines of caricatures rather than portraits, which is another canny decision from a guy who flat-out knows how to play to his own strengths. Simonson has long had a loose approach to anatomy matched with a kind of abstract, angular take on shadows and wrinkles. More in the Noel Sickles-Milt Caniff school of impressionist-style cartooning rather than flashy photorealism. If you want photorealism, you might as well just use stills and do a fumetti book. You get Simonson for an illustrative approach. Because it follows the film very closely, there's a lot of talk in this book, with characters discussing the "bonus situation" and what to do about the alien. The movie has some memorable gore-- the chest-bursting scene, for example-- but for the most part it's a masterpiece of claustrophobic tension and production design. There's not a lot of comic book-style action. Rather than allow this to hamper his storytelling, Simonson finds ways to mimic Giger's "biomechanical" design sense with alienesque panel borders and then the occasional torrents of blood. 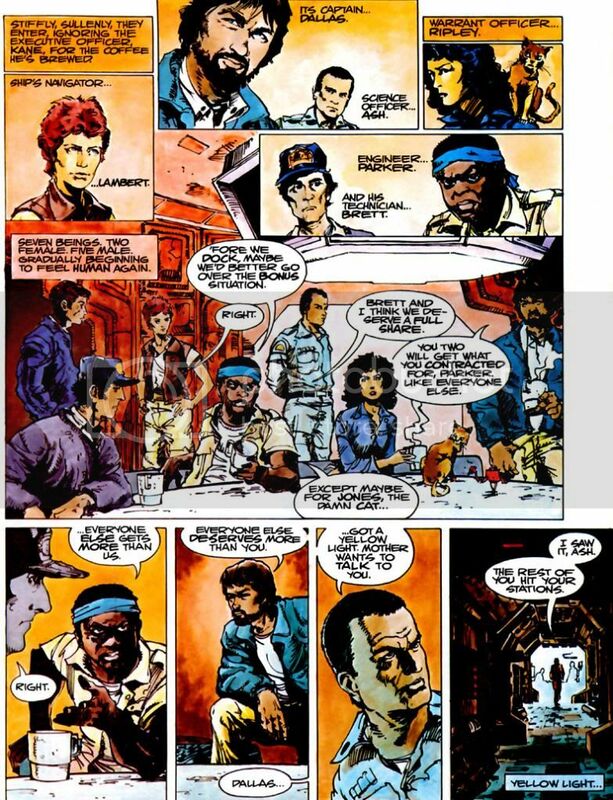 It's some of his finest work, a little bit Moebius (a frequent Heavy Metal contributor who spent a short time working on the Alien film) and a touch Cam Kennedy, who was doing some fine work for Fleetway around this time and later did some of the most visually distinctive Dark Horse Star Wars comics. Another amazing aspect of this book is the lettering by John Workman. This is the kind of stuff where the lettering is fully integrated into the artwork itself rather than just covering up parts of it. And finally, the coloring. I haven't seen the "re-mastered" version from Titan Books, so I don't know if they preserved the watercolor appearance, but back in the day, this is how the high-end graphic novels all looked (although few others really looked as good as this). The coloring style allows for extremely subtle gradients and blends so it's richer and more sumptuous than computer coloring.